YouView - an internet TV service that combines the UK's Freeview channels with on-demand content - has been formally launched. Users will have access to programmes broadcast over the previous week from the BBC, ITV, Channel 4 and Channel Five, as well as the ability to pause and rewind live TV. The project had originally been scheduled to begin in 2010. Some analysts have said the delay might have harmed its prospects. Lord Sugar, the project's non-executive chairman, showed off a set-top box made by Humax which will allow users to access the service. He said it would cost £299, but added that he would not be surprised if that fell to £99 in a couple of years. From retailers with no further subscription payments necessary. They will begin stocking set-top boxes later this month. From internet service providers (ISP) as part of one of their broadband packages. BT and TalkTalk - who are among the service's backers - said they would shortly unveil packages which would include additional content. Sky has said it would add its Now TV product offering access to movies, sport and entertainment at a later date. STV, Scotland's ITV franchise, also plans to offer on-demand content soon. 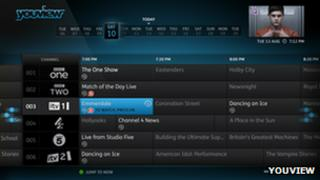 YouView was first announced in 2008 when it was called Project Canvas. It offers access to more than 100 digital TV and radio channels - some of which are in high definition. YouView said a further 300 content providers have expressed interest in joining the system. They include Amazon's Lovefilm service which has announced that TalkTalk subscribers would get 12 months access to its movie and television library. Some industry watchers have said that the subsequent launch of smart TVs with similar features may weigh on demand. However, Ian Watt from Enders Analysis added that it should still help the ISPs involved, giving them another tool to discourage customers switching to rival's all-in-one packages. "I'd say it's better late than never," he told the BBC. "For players in the telecoms space such as BT this move represents an attempt to level the playing field with Sky and Virgin Media. "They can piggyback the success of Freeview and offer lower cost entry points into the pay-TV market, providing an opportunity to attract more subscribers than they had been able to do with products such as BT Vision." BT recently agreed to pay £738m for 114 Premier League football matches across three seasons from 2013. Analysts have suggested the firm needs to treble its number of TV subscribers if it is to break even. The initial Humax box does not include wi-fi meaning some customers may need to buy additional equipment if they do not have wired internet connections in the same rooms as TVs they wish to attach. "Anything that comes along requiring extra bits and pieces at extra expense is going slow penetration into the market," said Paul O'Donovan, principal research analyst at tech consultants Gartner. "It's a great mistake that they haven't integrated wi-fi into the hardware at this stage. The future is all about integrating handheld devices such as smartphones and tablets with a TV and you can't do that without a wireless connection. "This gives Sky, Virgin and the Smart TV markers an opportunity to stay ahead for the foreseeable future."